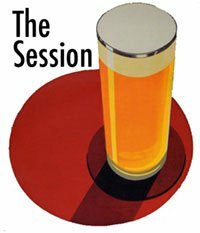 This months session is hosted by Jorge on Brew Beer and Drink it. He wants us to describe our perfect beer world, or any changes we could make that would lead in that direction. TheBeerNut has already touched on the simple answer of being able to walk to his actual local and drink beer he wants to drink rather than go out of his way to a more specialist beer bar. Since that would also be my perfect beer world, there is no need for me to talk about that one so what else can I think of? Well I would love it if people in Ireland changed their attitudes. Irish people, and this might not be specific to Ireland but we are very brand loyal. A Guinness drinker will not drink Murphy's or Beamish as a rule. Carlsberg drinkers will not drink Heineken and vice versa. Eventually someone will come up with a good marketing ploy and a new brand will be introduced and take off. Coors light and then Bud light is one that comes to mind in Ireland. Only the big boys with marketing budgets in the millions can get away with this though. For a small start up brewery, that's impossible so you rely on word of mouth, curiosity and the publican promoting the beer, not to mention people like myself blogging, and tweeting about the products. The average Joe might not follow us on twitter or read our blogs but other people do and some of them might be journalists looking for a story, read about a beer, try it and then they have their story about a new start up brewery making a go of things. It happens all the time. So what I would like would be for Irish people to be more adventurous with their beer. They will try any concoction of spirits if there is an umbrella sticking out of it so why not beer? As a nation, we are not very adventurous with our food either. Meat and two veg and the odd Chinese takeaway seems to be the order of things. That seems to be changing but I would say it's partially down to the influx of foreign nationals, a great thing for diversity in Ireland and long overdue. I would also like to see a change in attitude among Irish people that alcoholic drinks are there only to get pissed. Each successive government makes the same stupid mistakes and increases the duty etc. on alcohol making it more expensive but makes no difference to the so called binge drinking epidemic concerned citizens and media go on about. Instead, we should focus our attention on making public drunkenness socially unacceptable so that social drinkers who just want to enjoy themselves and their beer are not targeted. Séan Billings already went in to a lot of detail here and then made it part of his Beoir AGM speech here. It's well worth a read. So that's it, I will take a change in attitude and TBN's local beer in local pubs and the world will be a better place. Perhaps not perfect, but enough to be utopian. Perfection is subjective after all. The perfect beer world probably has something to do with the number 69 though. Just sayin!